Offshore Blow-Out Preventer (BOP) fluids are critical to the reliability and functioning of the BOP control system. These water based fluids and make-up water supply are normally tested by taking daily or weekly samples that are sent to a lab onshore. This periodic testing may completely miss or at best delay the corrective action of an event of poor quality fluid that has made its way to the BOP equipment. Continuous and or periodic filtration helps maintain the high level of cleanliness recommended by the BOP control system manufactures. 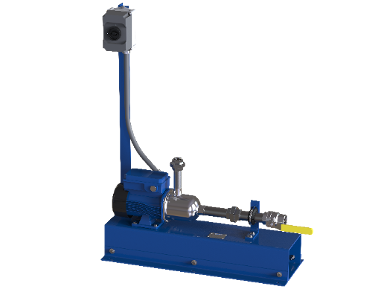 The Subsea Company’s compact modular pump skid delivers up to 33 GPM of flow and can be placed almost anywhere near the mix tank. Designed specifically to work in conjunction with our BOP Fluid Quality Monitoring & Filtration Panel, it can also be utilized to deliver clean water or concentrate to the mix tank. Power can be applied manually or automatically as required. Aside from the improved fluid quality the continuous filtration provides, The Subsea Company has monitoring equipment that can capture NAS or ISO standard levels of fluid cleanliness, pH or conductivity indications of dissolved solids. Analysis of this data and correlating it with known events and activity surrounding BOP fluid make-up, storage and use will assist the subsea engineer to eliminate the occasional incidents that cause poor BOP fluid quality thus reducing downtime and saving money. Our customers can rely on our exclusive BOP Fluid Conditioning and Monitoring systems to improve their BOP fluid quality and reliably capture data that will allow them to track fluid quality and improve their subsea BOP control system reliability.